WASHINGTON --- Following Defense Secretary Chuck Hagel's announcement today during Senate testimony that the United States is augmenting its participation in NATO's air policing mission in the Baltics and will increase joint training through its aviation detachment in Poland, a defense official provided additional information. 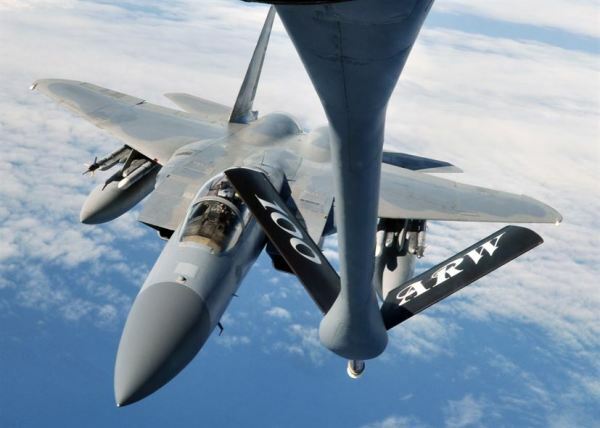 In a statement provided on background, the official said the United States currently provides four F-15s to fill NATO's January-through-April air policing rotation in the Baltics. For the past 10 years, the official said, allies have provided on-call aircraft on a rotational basis to help in identifying and responding to violations of Baltic airspace. In addition to the United States, Great Britain, France, Germany, Italy, Spain, the Netherlands, Denmark, Norway, Portugal, Belgium, Poland, Romania, Turkey and Czech Republic all contributed rotations over time since the mission's inception, the official added. This week, the United States will send six additional F-15s and one KC-135 to augment the mission, the official said. These aircraft -- currently based at Lakenheath in the United Kingdom -- will be deployed to Siauliai Air Base in Lithuania. This action comes at the request of the United States' Baltic allies and "further demonstrates our commitment to NATO security," the official said. Poland hosts 10 U.S Air Force personnel to support rotations of U.S. F-16s and C-130s for joint training with the Polish air force, the official said. The aviation detachment, or AVDET, is a practical way to strengthen interoperability with a key NATO ally, the official added, and represents the first continuous presence of a U.S. military unit on Polish soil. The AVDET has supported four training rotations for U.S. aircraft since late 2012. During his trip to Poland earlier this year, the official noted, Hagel visited with U.S. and Polish airmen from the AVDET alongside Polish Defense Minister Tomasz Siemoniak. WASHINGTON --- Following Defense Secretary Chuck Hagel’s announcement today during Senate testimony that the United States is augmenting its participation in NATO's air policing mission in the Baltics and will increase joint training through its aviation detachment in Poland, a defense official provided additional information. This action comes at the request of the United States’ Baltic allies and “further demonstrates our commitment to NATO security,” the official said. The detachment's presence in Poland also makes it possible to host multiple allied Air Force elements and serve as a regional hub for air training and multinational exercises, the official said, and the Defense Department is consulting with Polish allies on increasing activities associated with the detachment.